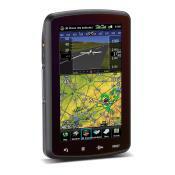 A successor to GDL 39 3D, the GDL 50 combines dual-link ADS-B traffic, a wide range of Flight Information Service-Broadcast (FIS-B) weather products, GPS and back-up aircraft attitude information that displays via Bluetooth® wireless technology on iPAD and Android devices, as well as Garmin aear-660, aera-795, and aera-796 portable GPS products. FIS-B weather products received by GDL 50 include NEXRAD imagery, METARs, TAFs, wind and temperatures aloft, PIREPs, NOTAMs and more. Additionally, pilots also have access to the most recent data as GDL 50 continually downloads traffic and weather information in the background — even while the display device is sleeping. In addition to comprehensive weather data, pilots utilizing GDL 50 can receive ADS-B traffic information and audible alerts to easily identify potential traffic conflicts while in-flight. Dual-link technology allows the GDL 50 to receive ADS-B “In” traffic on both 978 MHz and 1090 MHz frequencies, offering the most complete traffic picture and superior situational awareness. For aircraft that are properly equipped to meet ADS-B “Out” with a certified solution, the portable GDL 50 ADS-B “In” receiver provides an even better traffic picture by also receiving TIS-B traffic data from ground stations. 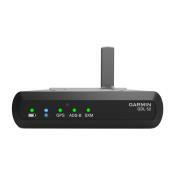 Exclusive to Garmin ADS-B receivers, the patented TargetTrend™ technology provides a more intuitive method of judging traffic trajectories and closure rates, particularly in airspace with high volumes of traffic. So, pilots can more easily discern traffic targets that pose the greatest threat. TerminalTraffic™ technology displays a comprehensive picture of ADS-B-equipped aircraft and ground vehicles throughout the airport environment on the moving map and SafeTaxi® airport diagram. ADS-B traffic can be overlaid on the dedicated traffic page, the moving map and IFR/VFR charts on compatible devices. 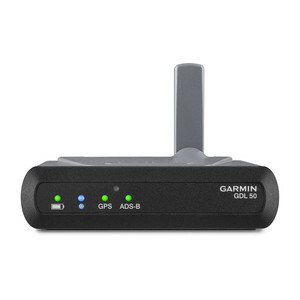 Boasting superior battery life, a built-in rechargeable lithium-ion battery allows GDL 50 to receive ADS-B traffic, FIS-B weather, GPS and backup aircraft attitude information for up to 8 hours on a single charge. On applicable devices, back-up attitude information can be displayed within the SVX™ synthetic vision feature or the aircraft panel pages for use in VFR conditions. 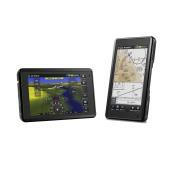 Capable of wirelessly streaming data to two devices and making hardwired connections to two additional devices simultaneously, GDL 50 offers quick and convenient access to essential information throughout the cockpit.